The Kishanganj contest, considered one-sided in favour of the Congress because of the over 70 per cent Muslim population, has come alive this time with AIMIM fielding former Kochadhaman RJD MLA Akhtarul Iman. On one side of Baisi Road is a public meeting to shore up support for Congress’s Kishanganj candidate Mohammed Javed. On the other, AIMIM chief Asaduddin Owaisi is addressing a meeting in support of party candidate Akhtarul Iman. RJD leader Tejashwi Prasad Yadav is scheduled to arrive to canvass for the Congress candidate. Baisi RJD MLA Haji Abdus Subhan is targeting Prime Minister Narendra Modi and is calling Owaisi the “Hyderabadi agent of BJP”. Soon, the Congress meeting is cut short as news arrives that Tejashwi has cancelled all his programmes for the day. In a short while, Owaisi is to arrive at the other venue some 250 m away and the crowd is surging there. It is time for Owaisi to arrive. Slogans of “dekho dekho koun aaya, sher aaya, sher aaya (see who has come, lion has arrived)” welcome him to the dais. Before he speaks, candidate Iman delivers an impassioned speech arguing why he had withdrawn from the 2014 contest when the JD(U) gave him a ticket. “I had a sense that (Bihar Chief Minister) Nitish Kumar would go back to the BJP. I pulled out of the contest to ensure secular votes are not split and Congress candidate Maulana Asrarul Haque wins. I was so right because Nitish did return to NDA,” said Iman. 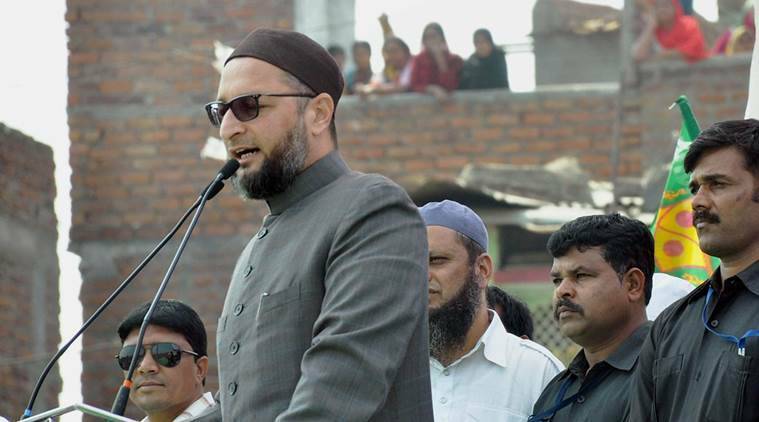 Owaisi then took the microphone amid cheers, taking a dig at JD(U) candidate Mehmood Ashraf by saying, “Ye Mehmood nahi Modi hai (he is not Mehmood but Modi)”. The AIMIM contested six Seemanchal seats in the 2015 Assembly polls but failed to impress. “But this election is different. Iman has travelled across Kishanganj in the last four years to impress upon people to vote in the name of development and not fall into the polarisation trap,” said Bihar’s AIMIM youth president Aadil Hasan Azad. Local resident Amitesh Kumar said the Congress might well be still ahead but “Owaisi was surely creating a flutter”. “With his oratory skills, Iman has also been trying to emerge as a Seemanchal voice after the death of former RJD MP Mohammed Taslimuddin and former Congress MP Maulana Asrarul Haque. This is where the JD (U) also sees an outside chance with the hopes of getting consolidated Hindu votes,” said Kumar.